Do-Wacka-Do is a first year trail race held in Erick, Oklahoma which is about as western OK as it gets. Just a couple miles from the Texas panhandle border. The money raised benefits the Roger Miller museum in Erick. I initially signed up for this race several months ago with the expectation of running this race alone. As the race date grew closer, my friend Kim and daughter in law April both decided to run it as well. There were three distances, 5 miles, 25K and 50K. K and A both signed up for the 5 mile race and I was signed up for the 25K. YAY, girls trip! We all took off a little early and headed to western OK. After driving 2.5 hours we arrived in Erick, OK and found the Roger Miller museum with no problem. After picking up our packets which were loaded with goodies such as a really cool tech shirt, beef jerky, highlighters, coupons and a jar gripper/opener thing, we walked a few doors down to a little diner where they had the spaghetti dinner. It only cost $5 and was delicious. Spaghetti, garlic bread, salad and peach cobbler. Mmmm! We decided to drive 12 miles south to the race site to make sure we knew where to go in the morning. Found it with no problems and got to meet Joel, the race director. Everyone associated with the race was incredibly nice. In the morning, we woke up to what felt like 100% humidity. I knew then it was going to be a long morning. All three distances started at 8:00 am. The first few miles flew by and it didn't take long for the runners to thin out along the course. Pure clay on those trails! I had to stop every 10 minutes or so and scrape the bottom of my shoes on rocks since they would pick up so much mud that each shoe felt several pounds heavier. Kim and I were running together and just before the turn off for the 5 mile runners announced she was feeling great and was just going to go ahead and do the 25K with me. I was shocked since her longest run ever was 13.1 miles and that was over a year ago! But she is in great shape and knew she could do it so on we ran. I had brought two small hand held bottles with Accelerade in them. I think I got behind on hydration early on and never quite caught up. I also brought Succeed! caps was taking them every 30 minutes but everything came to a screeching halt about 9 miles in. It felt like a truck had run over me and I struggled after that to run more than 5 minutes at a time. Felt weak and saw spots when I turned my head to fast. I managed to get through it and perked up a little bit at about the 14 mile mark. We finished in 3:50 for second and third female in our age group. We received awesome little wood plaques. I must say, the course is challenging. Quite a few very steep hills but at the top of those hills were fabulous sweeping views of the valley and canyons below. Very thick heavy mud added to the difficulty too. All the aid stations were playing Roger Miller music. There were tons of crystals strewn all over the land, ripe for the picking if you felt like carrying them around while running. Saw a millipede on the trail. Ran it with Kim which was a pleasant surprise! April finished strong for her first 5 miler ever! So proud of her! Will probably do this race again next year..we had a blast! Ahhhh...the taper! I love/hate it. Love the time that's immediately freed up since I'm not running in the evening. Hate that I eat non-stop and have so much energy I'm bouncing off walls! First blog entry! Not sure how consistent I'll be with this blogging thing, but since I do enjoy reading other runners blogs so much I'm going to give it a go. 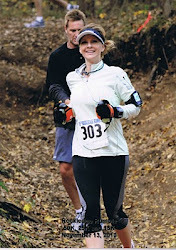 I want to have a record to look back on someday of my trail running and races. I'm 19 days out from the Do-Wacka-Do 25K in Erick, OK. This is a first year trail race and I'm super excited to run it. My friend and daughter-in-law will be making the drive with me and they are running the 5 miler. My training has been picking up and I'm happy so far with how it's been going the last two months. The IT Band is still making it's presence known, but is tolerable. I'm icing three times a day, taking homeopathic anti-inflammatories daily, foam rolling, stretching, yoga and hip strengthening. I thought about signing up for Turkey & Taturs 25K next weekend but am afraid that the hills might be to much for the IT Band and I'll set myself back to much. So I'll just keep on doing what I'm doing and hope that I can keep building mileage. I'm up to about 22 miles per week now with my last weekend long run of 12 miles. So excited that fall is almost here and I'll be able to run trails again with no poison ivy, snakes or chiggers to worry about!